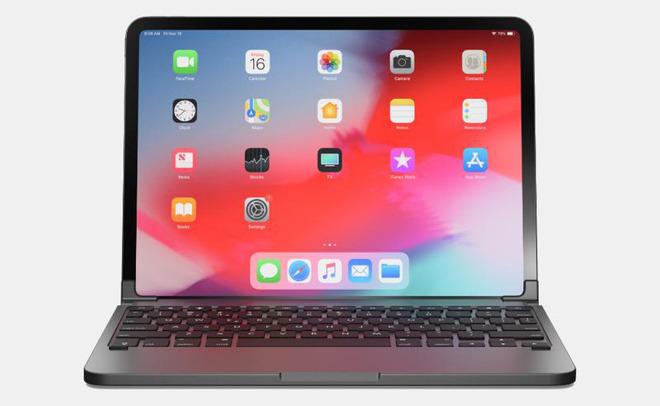 Accessory maker Brydge this week opened the pre-order process for the long-awaited keyboard cases for Apple's 2018 iPad Pro, including both the 11- and 12.9 inch formats. 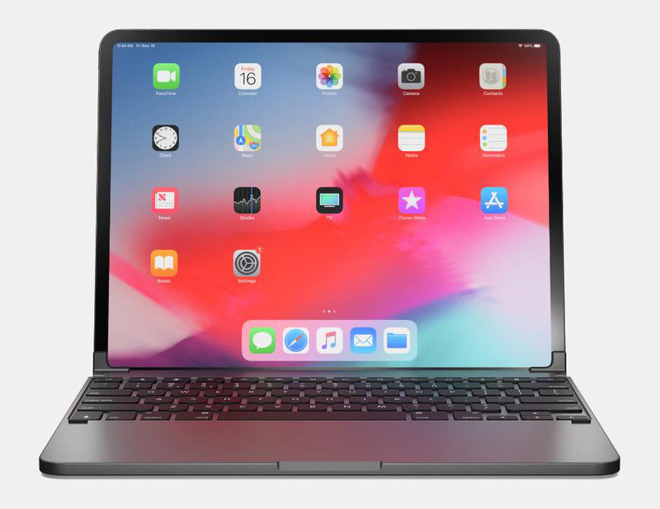 Each aluminum case connects to an iPad via Bluetooth, and has three-level backlit keys that resemble the layout of a MacBook, with the addition of dedicated iOS shortcuts. An included cover protects an iPad's back. While in the case an iPad can be rotated up to 180 degrees for typing at multiple angles. Brydge is aiming to ship the first cases on April 15, priced at $149.99 for 11 inches and $169.99 for 12.9 inches, with silver or space gray color options. Only the first 1,000 preorders will actually get a case on the 15th however. AppleInsider is at the Consumer Electronics Show in Las Vegas from Jan. 8 through Jan. 11, where we're expecting 5G devices, HomeKit, 8K monitors and more. Keep up with our coverage by downloading the AppleInsider app, and follow us on YouTube, Twitter @appleinsider and Facebook for live, late-breaking coverage. You can also check out our official Instagram account for exclusive photos throughout the event. It looks like something is missing...can’t quite put my finger on it. $170 for a BT keyboard? Why not use the "smart connector" on the back? It's quite shocking -- and annoying -- to me that we still do not have decent third-party Smart Connector keyboards, and the choice effectively comes down the ugly-dark-gray-feel-like-I-am-tapping-the-table-overpriced abomination that Apple sells. Anyone have a good explanation for why? I find it utterly bizarre also to not use Apple’s Smart Connector. Perhaps it’s a matter of a licensing fee? my guess is that Apple is charging for the smart connector, and or it would take even longer to create the device to work with the new shape. It's a shame that apple doesn't loop these guys in as they make the best iPad Pro keyboards. Honestly the fact that I couldn't get one of these when the new iPads launched was a reason I held back (also because I'd just dropped four grand on a MacBook Pro). I think I'll hold off until the next revision of the iPad Pro. If the new casing is the same as this gen's (suspect it will be) then I'll get this keyboard they. I actually like the new Apple iPad Pro keyboard. It’s a nice improvement in typing experience compared to the 12” MacBook my new 12.9” iPad Pro replaced. The only thing I miss is the backlit keys. I really don’t miss mouse input very much, either. I didn’t think I’d adjust to that, but it’s going better than expected. I still have an old ‘07 MBP for the rare cases I actually need a computer, but it’s mostly just collecting dust. I just feel like when you get to the point where you add a keyboard that doubles the weight and makes it a makeshift clamshell, all you've made is a worse clamshell laptop. I remain far more interested in a clamshell laptop running macOS and Apples in-house silicon, than continuing to wait for iOS's limitations to be slowly removed. And look at all that space for a trackpad!